A twenty-three man Lady Lone Star delegation headed by the Liberia Football Association Communications Director, Henry Flomo left for Nigeria last night to honor the second leg of their FIFA 2016 U-20 World Cup qualifier. The three new inclusions on the trip are Crystal Mulbah, Jestina Wilson, and Mercy Jarvan, while Felecia Wilson is dropped along with Precious Lawson and Jessica Koffa is out through suspension. The Coach Chris Wreh didn’t make any wholesale changes to the team that lost 7-1 in Monrovia twelve days ago except that there is no place for right-back Felecia Wilson who had a terrible game and Precious Lawson who made the bench was dropped entirely from the squad. Left-back Jessica Koffa could not travel because she is suspended after her red card in the first leg. So, the three new inclusions are Mercy Jarvan, Crystal Mulbah, and Jestina Wilson no relation to the omitted Felecia Wilson. The delegation includes a fifteen-man team and five Officials. The Lady Lone Star were thrashed 7-1 and need to perform soccer magic against the highly experience, organized and well-supported Falconets of Nigeria when they meet on Sunday. Having suffered such a humiliating defeat in the first leg, you would have thought that the team immediately went to camp to prepare for the return-leg away in Nigeria. “After the loss the players were sent home,” said a source close to the team. And training did not resume till last Saturday, in which all the players were not in attendance. 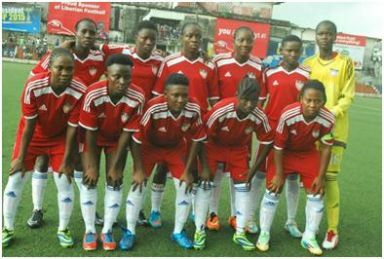 Massa Konneh (GK), JoettaWah (GK), KebehLamine (CPT), Gertrude Gbormoe, Margaret Stewart, Ruth Wesseh, Bernice willie, Agatha Nimene, KantiesSayee, Angeline Kieh, Pauline Agbotsu , Jacqueline Gooding, Francisca Howe, Marie Flomo, Lucy Massaquoi, Mercy Jarvan, Crystal Mulbah, and Jestina Wilson. Head of Delegation: Henry Flomo, Coach: Chris Wreh, Asst Coach: Oliver Makor, Team Manager: Patricia Moore, Messeur: Massa Mangue.